GAINESVILLE, FLORIDA, March 28-30—He’s back. On the final day of the Florida Relays, the stick events grabbed the attention, much of that due to the promising return of Canadian sprinter Andre De Grasse. The double medalist (100 bronze, 200 silver) at the Rio Olympics had to cut his last two racing seasons short because of hamstring woes. He looked plenty healthy in Gainesville as he stormed anchors for two Canadian relays that zipped to the top of the yearly lists. First came the 4×1, where the Great White North’s foursome clocked 38.34 to top a pair of all-star squads, De Grasse taking the stick second before storming to a convincing win. A USATF High Performance foursome that featured Justin Gatlin and Tyson Gay on the last half clocked only 39.07 in 4th. Then came the 4×2, where third leg Brendon Rodney brought Canada back from a big deficit at halfway. De Grasse got the stick nearly even with the leaders, but exploded to a 6m win in 1:20.17 out of lane 3. The top individual race of the weekend belonged to (surprise!) Gator great Grant Holloway, who put together a solid flight of hurdles to top SEC rival Daniel Roberts of Kentucky, 13.28–13.30. Despite being run into a slight wind, the mark was a world leader. Later in the day Holloway took 2nd in his section of the 200 with a 20.66. On Saturday he contributed a pair of legs to the Gator relay cause, starting with a 38.69 effort that topped the collegiate entrants. In a stunning finish to the climactic 4×4, Holloway got the baton in 5th and threw everything he had left in an effort to catch Iowa’s Mar’yea Harris on the anchor. Harris had taken the baton in 2nd and ran an impressive come-from-behind leg himself, tagging Western Kentucky with about 50 left. At that point, Holloway was still 10m behind, but his final rush left him inches short at the finish. Still, his 44.15 nearly caught Harris’s 44.61 as Iowa won in 3:03.10 to Florida’s 3:03.25. The remaining university relays went to South Carolina (1:21.87), Penn State (7:19.50 WL) and Charlotte (58.84 WL). Sharrika Barnett completely dominated a 400 field that included two other NCAA Indoor finalists, cranking out a 50.96 world leader. “I wasn’t expecting to go that fast,” she said. “It wasn’t what she ran,” said coach Mike Holloway, “it was how she ran it. It was smooth, it was even, it was strong. She didn’t hit a wall. It was impressive. 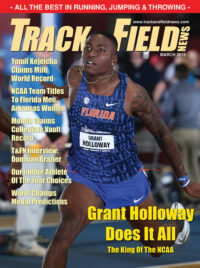 I’m really excited about what she can do moving forward.” A day later, Barnett proved it was no fluke, getting the Gators into the hunt in the 4×4 with a second-leg carry of 49.7. That put the Gators in great position, but on the final stretch South Carolina nabbed Florida before the line, anchor Wadeline Jonathas running a hard-finishing 50.03 (more than 2 seconds faster than her open best). Gamecocks 3:27.53, Gators 3:27.76. The University 4×1 went to Miami (43.56). Alabama took the 4×2 (1:31.80 to become the No. 10 school ever). World leaders went to Ohio State (8:30.79) and Georgia Tech (54.59). 100(2.6): 1. Zhenye Xie’ (Chn) 10.14w; 2. Adam Gemili’ (GB) 10.15w; 3. Kemar Hyman’ (Cay) 10.20w. 200(1.9): 1. Alex Quiñónez’ (Ecu) 20.28; 2. Yohan Blake’ (Jam) 20.57; 3. Sean McLean (unat) 20.64; 4. Jerome Blake’ (Can) 20.72. II(4.8)–1. Omar McLeod’ (Jam) 20.62w; 2. Winston George’ (Guy) 20.75w. III(3.6)–1. Yancarlos Martinez’ (DR) 20.49w. VIII(2.8)–1. Andre Ewers’ (FlSt) 20.69w. 400: 1. Anthony Zambrano’ (Col) 45.52; 2. Alonzo Russell’ (Bah) 45.53. 110H(-2.3): 1. Andrew Riley’ (Jam) 13.55. 400H: 1. Rilwan Alowonle’ (Ngr) 50.36; 2. David Kendziera (unat) 50.46; 3. Jeffery Gibson’ (Bah) 50.77; 4. Andre Colebrook’ (Bah) 50.86. 5. Thailand 39.67 (Namsuwan’, Chuangchai’, Meenapra’, Punpa’); 6. USATF HP B 39.87 (Bacon, Batson, Belcher, Cotton). II–1. PURE Athletics 39.24 (Bledman’, Edward’, Gay, Harvey’); 2. USATF HP C 39.41; 3. Canada 39.41. 4. USATF High Performance 1:23.09 (Dukes, Friday, Gatlin, Gay). II–1. USATF High Performance 1:22.23; 2. USATF High Performance 1:23.23. 3. Canada 3:04.26; 4. Dominican Republic 3:04.44; 5. USATF HP 3:04.96. 100: III(-0.4)–1. *Raheem Chambers’ (Mia) 10.27; 2. **Hakim Sani Brown’ (Fl) 10.30. IV(0.8)–1. *Raymond Ekevwo’ (Fl) 10.28. 200(-0.7): 1. Rodney Rowe (NCAT) 20.60; 2. *Grant Holloway (Fl) 20.66. II(0.6)–1. *Akeem Sirleaf’ (NCAT) 20.50; 2. Brown’ 20.53; 3. Nick Gray (OhSt) 20.67; 4. Izaiah Brown (Rut) 20.68; 5. *Antonio Woodard (Ia) 20.69. 400: 1. *Trevor Stewart (NCAT) 45.18; 2. **Dwight St. Hillaire’ (Ky) 45.92; 3. Mar’yea Harris (Ia) 46.02. II–1. ***Jacory Patterson (VaT) 45.76. IV–1. **Brian Faust (Pur) 46.05. 800: I–1. Andrés Arroyo ’ (PR) 1:45.97; 2. Avery Bartlett (GaT) 1:47.54; 3. Sho Kawamoto’ (Jpn) 1:47.55; 4. **Domenic Perretta (PennSt) 1:47.75; 5. Allon Clay’ (Jpn) 1:48.31. II–1. *Matt Manternach (Ia) 1:48.65. III–1. Alek Sauer (Col) 1:48.474. 1500: 1. *Benjamin Young (Ky) 3:42.62. St: 1. Ricardo Estremera’ (PR) 8:45.24. 5000: 1. *Noah Perkins (NFl) 14:02.65. 2. *Daniel Roberts (Ky) 13.30; 3. Isaiah Moore (SC) 13.70; 4. **Trey Cunningham (FlSt) 13.74. 400H: 1. ***Thomas Burns (Mia) 50.62. 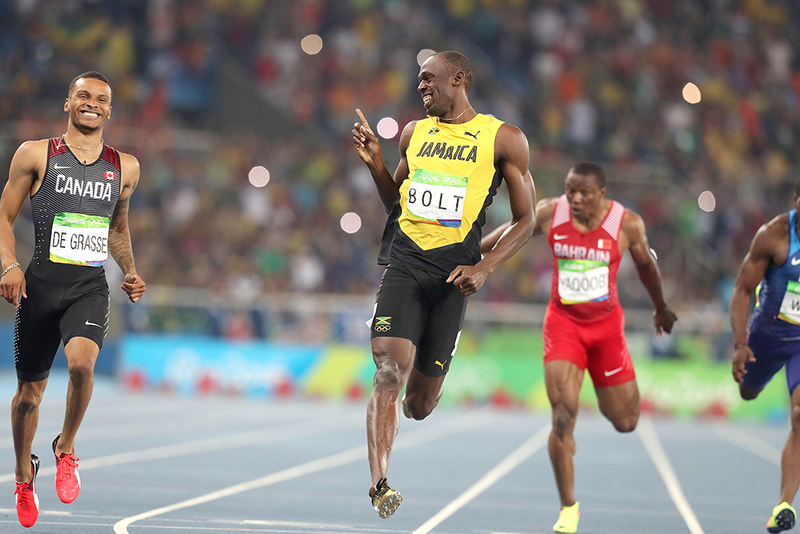 4 x 100: III–1. Florida 38.69 (Ekevwo’, Sani Brown’, Holloway, Clark); 2. Florida State 39.21; 3. North Carolina A&T 39.21; 4. Clemson 39.59; 5. Western Kentucky 39.77; 6. Kentucky 39.85; 7. Ohio State 39.91; 8. Auburn 39.93. IV–1. Purdue 39.86. 4 x 200: III–1. South Carolina 1:21.87 (AL) (Fuller, Hall, Miller, Sessom). 4 x 400: 1. Iowa 3:03.10 (Lawrence, Woodard, Hofacker, Harris 44.61); 2. Florida 3:03.25 (Hill, Sawyers’, Villaman’, Holloway 44.15); 3. Western Kentucky 3:03.78; 4. South Carolina 3:04.08; 5. Rutgers 3:04.27; 6. North Carolina A&T 3:05.13; 7. Ohio State 3:05.42; 8. Charlotte 3:06.23.II–1. Purdue 3:05.58; 2. St. Augustine’s 3:05.61; 3. Clemson 3:05.63; 4. Maryland 3:06.61. 2. Indiana 7:21.68; 3. Columbia 7:21.97; 4. Ohio State 7:22.98; 5. Georgia Tech 7:25.14; 6. Clemson 7:26.13; 7. Kentucky 7:28.89; 8. North Florida 7:30.69. SpMed: I–1. Indiana 3:19.92 (Grimmer, Davis, Wallace, Newbern). II–1. Savannah State 3:22.73. HJ: 1. Django Lovett’ (Can) 7-4½ (2.25); 2. **Rahman Minor (Ky) 7-1 (2.16); 3. Jhonny Victor (Fl) 7-1. PV: 1. *Adam Coulon (In) 18-1¼ (5.52). LJ: 1. Mohamed Abukaker (unat) 25-6 (7.77); 2. Corion Knight (unat) 25-4½ (7.73); 3. KeAndre Bates (unat) 25-4½w (7.73). TJ: 1. Clive Pullen’ (Jam) 54-8¼ (16.67); 2. Alphonso Jordan (unat) 54-4 (16.56); 3. Eric Bethea (In) 53-1½ (16.19). SP: 1. *Eldred Henry’ (Find) 66-9¾ (20.36); 2. Kord Ferguson (Al) 63-9½ (19.44); 3. **Connor Bandel (Fl) 62-½ (18.91). DT: 1. ***Roje Stona’ (Clem) 200-10 (61.22); 2. Greg Thompson’ (Md) 200-6 (61.13); 3. Kord Ferguson (Al) 190-5 (58.04); 4. Reno Tuufuli (Ia) 186-2 (56.74). 3. Denzel Comenentia’ (Ga) 241-8 (73.66); 4. Morgan Shigo (PennSt) 234-4 (71.44); 5. **Thomas Mardal’ (Fl) 234-4 (71.42); 6. AJ McFarland (Fl) 228-0 (69.51); 7. *Kevin Arreaga’ (Mia) 226-2 (68.94); 8. ***Bobby Colantonio (Al) 218-10 (66.71). 100(0.1): 1. Angela Tenorio’ (Ecu) 11.25; 2. Liang Xiaojing’ (Chn) 11.26. 200(3.1): 1. Marileidy Paulino’ (DR) 23.03w; 2. Joanna Atkins (unat) 23.41w. 400: I-1. Jordan Lavender (unat) 52.54; 2. Brionna Thomas (unat) 52.70; 3. Natoya Goule’ (Jam) 53.12; 4. Claudia Francis (unat) 53.54. II–1. Maddie Price’ (Can) 52.30; 2. Maya Stephens’ (Can) 52.87; 3. Asha Ruth (CPTC) 53.48; 4. Cynthia Anais’ (Fra) 53.56. 4. Katrina Seymour’ (Bah) 57.59. 3. Tumbleweed TC (China) 43.37); 4. USATF HP B 44.51 (Bryant, Conley, Carter, Manning-Clemons); 5. Canada 44.75. 2. USATF HP 1:33.52 (Conley, Cunliffe, Freeman, Hill); 3. USATF HP B 1:34.22 (Hobbs, Jefferson, Jones, Pierre). II–1. USATF HP C 1:33.14; 2. TWCUS 1:35.40. 2. Canada 3:28.54; 3. PURE Athletics 3:29.26; 4. USATF HP B 3:31.25; 5. USATF HP 3:34.85. II–1. Clutch Performance 3:32.98. 100: II(2.3)–1. Kayla White (NCAT) 11.04w; 2. **Ka’Tia Seymour (FlSt) 11.08w; 3. Kianna Gray (Ky) 11.25w; 4. **Tamara Clark (Al) 11.30w. 2. ***Cambrea Sturgis (NCAT) 23.02; 3. ***Abby Steiner (Ky) 23.02. II(3.9)–1. *Mauricia Prieto’ (Al) 22.86w; 2. **Savyon Toombs (Jack) 23.22w; 3. Kong Lingwei’ (Chn) 23.23w; 4. Lenysse Dyer (Tn) 23.44w. III(1.5)–1. *Takyera Roberson (Al) 23.34. 2. *Chloe Abbott (Ky) 51.61; 3. ***Alexis Holmes (PennSt) 52.08; 4. *Aliyah Abrams’ (SC) 52.28; 5. **Taylor Manson (Fl) 52.82; 6. *Natassha McDonald (Al) 52.87; 7. Lenysse Dyer (Tn) 52.95. II–1. *Wadeline Jonathas (SC) 52.18; 2. Kat Surin’ (Ct) 52.94. III–1. **Stephanie Davis (SC) 52.24; 2. Zoe Sherar’ (Can) 52.34. 4. Rachael Walters (GVal) 2:05.68. III–1. Julia Rizk (OhSt) 2:05.15. 1500: 1. *Kelsey Harris (In) 4:18.23; 2. *Esther Gitahi’ (Al) 4:18.40; 3. ***Imogen Barrett’ (Fl) 4:18.52; 4. Alexandra Lucki’ (Md) 4:18.62; 5. *Martha Bissah’ (Norf) 4:18.78. St: 1. Carolina Lozano’ (Arg) 10:06.62. 100H(-1.4): 1. *Cortney Jones (FlSt) 13.04; 2. *Madeleine Akobundu (NCAT) 13.21; 3. Kyra Atkins (UNCC) 13.33. V(2.2)–1. *Faith Ross (Ky) 13.32w. 400H: 1. ***Masai Russell (Ky) 57.57; 2. *Lakeisha Warner’ (Clem) 57.86; 3. Samantha Gonzalez (Mia) 57.92; 4. *Shannon Kalawan’ (StA) 58.04; 5. Anna Runia’ (Mia) 58.67; 6. **Nikki Stephens (Fl) 58.91. 2. CeCe Telfer (FP) 57.79; 3. Jasmine Barge (Nb) 57.82; 4. *Faith Ross (Ky) 57.94. 4 x 100: II–1. Miami 43.56 (Brown, Steele, Mason, McMinn); 2. Kentucky 43.63 (Barnes, Steiner, Ross, Gray); 3. Alabama 43.65; 4. Florida State 43.84; 5. South Carolina 43.86; 6. Clemson 44.55; 7. AARP 44.81.III–1. Alabama 44.16; 2. Jacksonville 44.61; 3. UCF 44.75. 2. South Carolina 1:33.00; 3. Miami 1:33.34; 4. Nebraska 1:35.64. 2. Florida 3:27.76 (Manson, Barnett, Stephens, Anderson 51.02); 3. Alabama 3:28.60 (McDonald 52.46); 4. Kentucky 3:31.66 (Abbott 50.22); 5. Miami 3:32.22; 6. Clemson 3:32.67; 7. Tennessee 3:34.70. II–1. St. Augustine’s 3:35.03; 2. Purdue 3:35.73; 3. Maryland 3:35.90; 4. Iowa 3:36.32; 5. Clemson 3:36.61. 2. Indiana 8:32.89; 3. Florida 8:34.09; 4. North Florida 8:47.04; 5. Troy 8:49.03; 6. UCF 8:49.56; 7. Georgia Tech 8:50.86. II–1. Rutgers 8:50.86. SpMed: I–1. Norfolk State 3:45.74 (Grant, Parker love, Pride, Bissah); 2. Georgia 3:47.01; 3. Ohio State 3:49.12; 4. Iowa 3:52.85. II–1. LIU Brooklyn 3:54.82; 2. Indiana 3:55.83; 3. Maryland 3:56.53. 2. Troy 57.50. V–1. Austin Peay 59.05. HJ: 1. *Ellen Ekholm’ (Ky) 5-11¼ (1.81). PV: 1. Sophie Gutermuth (unat) 13-9¼ (4.20). LJ: 1. Darrielle McQueen (unat) 21-3¼ (6.48); 2. *Kala Penn’ (Fl) 20-4¼ (6.20). 3. Marie-Josee Ebwea-Excel’ (Ky) 44-10¾ (13.68); 4. Christina Epps (GSTC) 44-4¾ (13.53); 5. Asa Garcia (Fl) 43-10w (13.36) (43-4½/13.22); 6. *Kala Penn’ (Fl) 43-1¾ (13.15). SP: 1. Brittany Crew’ (Can) 58-4 (17.78); 2. Portious Warren’ (Al) 57-2¼ (17.43); 3. Sarah Mitton’ (Can) 56-8¾ (17.29); 4. Haley Teel (Al) 56-2½ (17.13); 5. *Sade Olatoye (OhSt) 55-5½ (16.90); 6. ***Madison Pollard (In) 53-11 (16.43); 7. **Nickolette Dunbar (Al) 53-0 (16.15). DT: 1. *Shanice Love’ (FlSt) 197-9 (60.29); 2. *Laulauga Tausaga (Ia) 189-5 (57.74); 3. Venique Harris’ (Alb) 186-0 (56.69); 4. **Alexandra Emilianov’ (Ks) 185-1 (56.41); 5. Chioma Onyekwere’ (Ngr) 181-11 (55.46). HT: 1. *Veronika Kanuchova’ (FlSt) 214-7 (65.42); 2. Pavla Kuklova’ (VaT) 212-2 (64.66); 3. *Sade Olatoye (OhSt) 205-8 (62.70). We’re sometimes not sure where longtime correspondent Peter McKenzie will show up next. The kid's feet gather no moss.